INSERCO is specialized in inserts, fasteners and more generally in innovative assembly systems. We have an important stock of fixations in order to respond to your immediate needs and to provide logistics service whenever customer’s production variations occur. For more than 10 years now we are working hand in hand with partners from the automotive industry and develop solutions for all industrial sectors: plastic and sheet metal working companies, electronic industry, electric industry, machinery, aeronautics and defense, transport and solar industry, furniture industry, sport and leasure, heating etc… The know-how of INSERCO is based on a long-term experience with the companies PSM and LEVRAT FASTENERS. Our team still operates from Angers, the original town of our activity. All our products are produced and supplied under strict control according to ISO 9001 2015 and respond to the requests by the automotive industry. 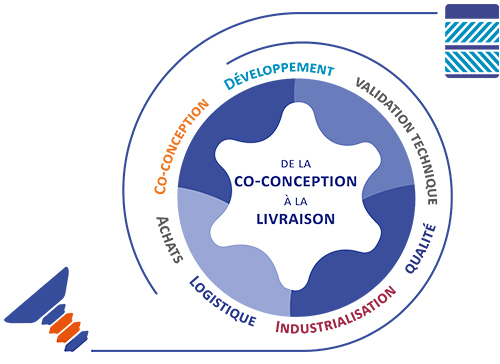 Inserco is part of the Linksy group’s approach, which develops complete assembly systems with its customers, with global project management. From components co-design to delivery of production parts, we are present at every phase of your project. From the small aerospace serie at the large automotive serie, we ensure a reliable and global service. – Anti-seize treatments, masking, protection, etc. Run-in to the requirements of the automotive industry, our quality systems are ISO 9001 certified and compatible with TS16949 and EN9100. – A single contact person for the entire value chain, from design to supply of parts.